Throughout the year, Celebrity Reflection chases the warmth of the sun, migrating between the Caribbean and Europe. Between November and April, warm your toes in the white sand and tropical waters of the Caribbean. 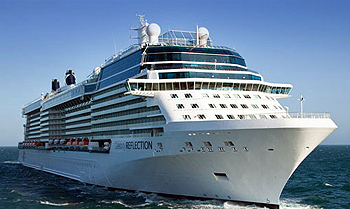 Celebrity Reflection‘s Caribbean itineraries depart from Fort Lauderdale and range between 7 and 14 nights duration. While there are a small number of seven night cruises, and an even smaller number of 14 night cruises, you’ll find the largest number of options in the 10 and 11 night range. Cruise the eastern Caribbean including Mexico, the western Caribbean, or take a trip to the much less frequented southern Caribbean islands. As the weather starts to head into it’s wetter months in the Caribbean, make your way across the Atlantic to embark on a European Summer cruise. Cruise the Mediterranean from Rome or Barcelona and visit the iconic ports of the western Mediterranean including France and Spain, or in the Eastern Mediterranean the cultural Italy and Greece, to name a few. Departing from Amsterdam and Dun Laoghaire (Dublin), Celebrity Reflection can introduce you to the awe-inspiring world of Northern Europe including Scandinavia and the Baltics, British Isles, or Iceland and Norway. View all Celebrity Reflection cruises, view a selection of Celebrity cruise deals, or view more options for Celebrity cruises. Celebrity Reflection boasts an expanded deck, 72 additional staterooms, extra seating in the main and specialty restaurants, more sun lounges on the pool deck, and more seats in the theatre. Celebrate the flavorful joys of outdoor grilling at the new Lawn Club Grill. Enjoy more than 20 delicious dining options in the Main Restaurant. Unwind in your own cabana-style haven at The Alcoves. Treat yourself to new spa innovations at the enhanced Canyon Ranch SpaClub. Your vacation time is precious. Time aboard Celebrity Reflection will make the most of it. Experience the thrill of grilling near a lawn of fresh-cut grass while surrounded by an endless view of the sea. Act as your table’s grill master and enjoy a one-on-one interaction with our chefs, receiving a lesson in proper grilling techniques and learning other tricks of the trade. Choose from a gourmet salad bar, build your own pizza, and enjoy more than 12 grill specialties, including USDA Choice Beef; poultry; seafood; and vegetables. The first AquaClass Suites, Reflection Suites and Signature Suites in our fleet make their debut on Celebrity Reflection along with an enhanced Spa filled with some of the hottest (and coolest) spa innovations around. Qsine is a uniquely unordinary experience with elements of surprise and delight. Our concept behind Qsine was to give you something you’ve never experienced before on land or sea. Leave any preconceived notions behind. Dig in and try new things. It’s time your palate got a wakeup call. Our iPad menus are fun, interactive, and full of surprises. A premium, private lounge for those in Reflection, Penthouse, Signature, Royal, and Celebrity Suites, as well as for Captain’s Club Zenith members. This luxurious club features a large-screen TV, reading areas stocked with magazines, newspapers, and books, plus a continental breakfast. Complimentary drinks are available throughout the day and canapÂ©s are served with evening cocktails. Michael’s Club is available 24 hours a day with selected service hours from the Michael’s Club Concierge. The Reflection Suite-our fleet’s first two-bedroom suite-is located in a private area accessible only to guests carrying a special SeaPassÂ® card. You’ll sleep on a premium ReverieÂ® Dream Sleep SystemÂ mattress you can customize, experience the luxury of European-style butler service, and shower in a spectacular sea view bathroom with cantilever, all-glass shower. In a spacious Signature Suite, you’ll relax in airy, high-ceiling rooms with floor-to-ceiling glass doors and windows, sleep on a premium ReverieÂ® Dream Sleep SystemÂ mattress you can customize, enjoy the European-style butler service, and relax on a veranda with lounge seating. Located in a private area accessible only to guests carrying a special SeaPassÂ® card.